I first saw Talia Joy Castellano on Instagram and thought she was very talented. Actually, I didn't know about her real story until today. All I knew was how inspirational she was and that a lot of people esp. the young generation look up to her because of her amazing makeup tutorials in YouTube. She was very strong and positive. She used makeup as her way of saying that she can do it and will survive. So I was really shocked by the news that Talia passed away yesterday, July 16, after a 6 year battle with cancer. An update on her official Facebook page says and I qute, "Less than a day has passed since our Angel left her Earthly form and seeing the response form all over the world has really touched our hearts. Talia is everywhere you look and we couldn't be more pleased... And we especially know she is loving all the attention! We have received an overwhelming amount of messages sending love, kindness and support from millions. As we read message after message, we smile and cry with tears of joy and sadness. 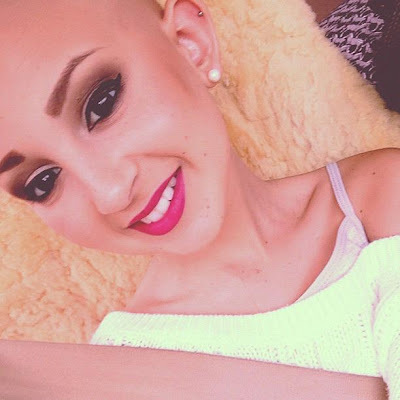 We can literally feel how much all of you loved Talia. We can't thank all of you enough for this. Thank you everyone for understanding how special this little girl was to us and to this world. Thank you for keeping her spirit alive and showing her family that her message and voice will continue to make an impact across the globe". Talia at the Ellen Degeneres show wherein she became an honorary CoverGirl..
A lot of people will miss this girl. I just cried looking at her old photos and the notes that people wrote on her page. I feel bad that children like her had to suffer. I feel bad for her mom. I cannot imagine her and her family's sadness right now. I pray that God take care of Talia and give her a special place in heaven. I also pray that no more kids will end up that way. Amen. I really feel bad. I like her so much, have you watch her interviews with ellen she's the happiest girl with cancer.. She's so strong and everything in between.. She enjoy her life until the very end. Such a very young, pretty girl... There are still so much to do, so much to see, and so much to learn for her. she was so young and pretty :( but at least she was able to inspire a lot of people before leaving this world. I felt crying, too, while reading your post. how sad :( heartfelt sympathy for the family.